I read this week about Simon Cloudesley, who “strode 114 miles from the Bodleian in Oxford, England, to the British Library in central London to raise thousands of pounds” for ECHO, the library for refugees in Greece that I wrote about in my last post. I thought that was really wonderful and wanted to pass the story along to all of you. The other thing I want to share is an article in American Libraries about how Georgia Tech’s dean of libraries has reorganized the technical services department using “supply chain” theory. Dean Murray-Rust explains, “Staff members will be able to switch from managing interlibrary loans to creating basic archival records, from processing reserves to ordering online, as demand necessitates. Employees are learning how to manage more than 10 library systems, rather than one or two.” Quick aside for you non tech services types: that’s the department in a library that manages the acquisition, cataloging, and processing (labeling, covering, barcoding, security taping, etc.) of print and digital materials, including purchases, patron-driven acquisitions (which are sort of temporary loans that trigger a purchase if patrons use the item 3 times), and subscriptions, including newspapers, magazines, and databases. Obviously Georgia Tech is much larger than my university and has more libraries, but I was intrigued by this. We have a pretty small staff, and we often face having to come up with backup plan for tasks that only one or two people know how to do when someone is out on vacation. We’ve improved on this with a lot of cross training, but people mostly still work on just one aspect of technical services on a day to day basis. I’m thinking this supply chain style would mean total cross training. Anyone could do anything. It sort of sounds like what people do on a given day would depend on the greatest need that day. No more generalist reference librarians, and it sounds like librarians are not as involved in the traditional “transactions” that take place at service desks in many libraries. Instead, they are outside the library working with faculty and students and specializing in data management, intellectual property, and the digital preservation of research. It all sounds very interesting, and relevant to Georgia Tech. That part of the restructuring doesn’t sound nearly as applicable to my university which is more of a teaching/learning institution than a research hub. But there may be ideas from this transformation that we could adapt to our use. It’s all very intriguing and worth thinking about as it becomes common even in academia for people to question why libraries are necessary. Just this week I ran circulation numbers to show faculty at one of our largest departments that their students are in fact using books. If you work in a library, what are you doing to transform? Mountains in ancient times were considered the homes of gods, or places where man could draw near the divine. My brother sent me an article about a book mountain in the Netherlands which looks like heaven to me. 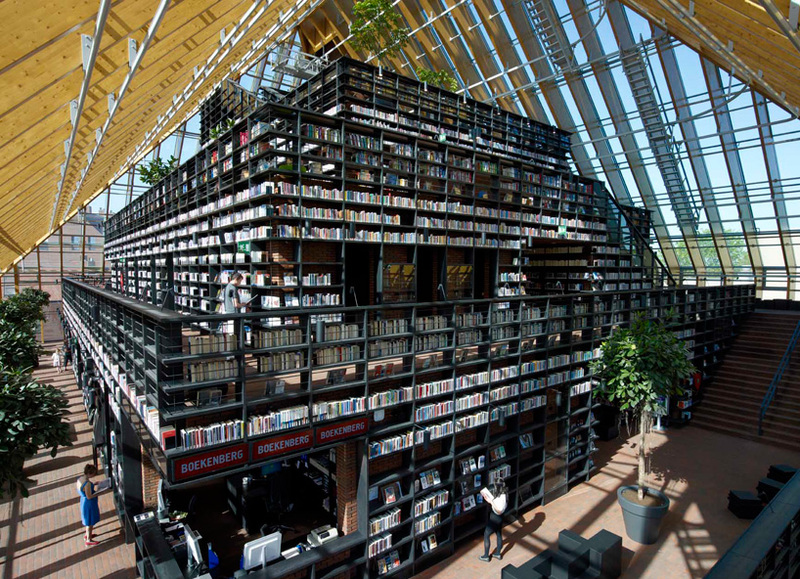 Architecture firm MVRDV explains the way the 10 year project, actually named Book Mountain and Library Quarter Spijkenisse, ties into the town’s history and setting. They plan to release a book, Make Some Noise, in late 2012 that will be a “photo novel” about the project. The Library Quarter includes 42 apartments from studios to large family units. Can you imagine living here? Wow. Really? My unscientific research reveals that library books have expected lifespans of 25-50 check-outs (which shows that there isn’t much consensus on this topic). Mending keeps some books going longer. I am pretty sure 4 years is a low estimate. Does anyone know the average shelf-life of books in your local library? I don’t have any idea how much the sun damages books. But I looked up average annual hours of sunshine and Rotterdam, near Spijkenisse, averages 1542 hours, versus 2519 where I live in New Hampshire. For reference to notoriously rainy and sunny places, I found that London averages only about 1600 hours of sunshine a year and Seattle, 2019 hours; Miami, 2900 hours; San Diego, 2958 hours; Honolulu, 3041 hours. Even New York City, which I would have guessed wasn’t particularly sunny since its weather is quite variable and it’s roughly in the middle of U.S. latitudes, averages 2677 hours. So if sunlight is detrimental to book life-span, Book Mountain might work better in Northern Europe than in many parts of the United States. I am stepping away from this post now, rather than spending the rest of my afternoon finding out which places in the U.S. have the least hours of annual sunshine. Because I’m tempted to look into that. My family visited England and France with our son, who’d been in England on a Gap Year. Our 11 day whirlwind tour included London, Milton Keynes/Bletchley Park, Paris, Bath, Hayward’s Heath (West Sussex), and Brighton. Two days after we returned, my daughter and I headed to Washington, D.C. for a homeschool version of the 8th grade pilgrimmage to our nation’s capital, plus a visit with her young cousins, aunt, and uncle. Along the way, I tried to note what people are reading and how. American and British readers have embraced Ipads and Kindles, although many are playing games rather than reading. I saw roughly 50% e-readers versus books. In Paris, people were reading actual books. The parks were of French and international readers. An afternoon event at Shakespeare and Company drew a small crowd. I didn’t see a single e-reader all day. In both the London Underground and the Paris Metro, poster-size ads for books were as prevalent as those for shows or films. Many of the London ads were for literary fiction. Fiction was the top choice of readers on trains and planes; people on e-readers are harder to spy on. I saw lots of adults reading The Hunger Games. Train station and airport shops are heavily promoting the Fifty Shades of Grey books. In England, Diamond Jubilee titles celebrating Queen Elizabeth and books about the Olympics are also prominent. In Holland Park, where we stayed, Daunt Books had an enticing window filled with books I recognized and some I didn’t, and inside, one of the best selections of travel titles I’ve ever seen. I visited a Waterstones, England’s biggest chain (which just agreed to carry Kindles). The staff there was knowledgeable and the display included some local authors and staff picks. Everything was clearly designed to feel like an independent store. I also enjoyed popping into some of the ubiquitous charity shops selling used books (Oxfam, for example) and a half-price remainders bookshop in Bath. I wish I’d had time to check out libraries as well. In fact, I could plan an entire trip around libraries and bookstores . . . .